Inspired by Roland Barthes, Meghan O’Gieblyn’s monthly column, Objects of Despair, examines contemporary artifacts and the mythologies we have built around them. Anthropologists have long suspected that reflections inspired the first conception of the soul: early man saw his face in a pond and believed it was an alternate self who would persist after his death. But if having a double gave you immortality, it also presented a new anxiety: your likeness could detach itself and take on a life of its own, or fall into the hands of your enemy. Many primitive taboos about reflections, shadows, and effigies stem from the conviction that you could harm a person by damaging their likeness. Witchcraft and voodoo introduced into our collective memory a nagging fear that we might one day become the slave to our shadows. I think of the scene in the 1944 musical Cover Girl, where Gene Kelly’s reflection in a store window comes to life and entrances Kelly into aping his erratic dance, as if puppeteering his marionette. The same choreography can be found in the countless Romantic-era fables where the hero trades his image to the devil for the love of a woman or the promise of eternal youth. The bargain never ends well. The reflection, once brought to life, acts out all of the hero’s repressed desires—an id made flesh—and ruins his reputation, inevitably driving him to suicide. As the psychoanalyst Otto Rank pointed out in his study of doubles, all these stories contain a moral: no matter how miraculous a reflection may seem, it is always a harbinger of death. Until recently, one did not find this look in photographs. Unlike the mirror, which flips our image horizontally (an illusion we’ve come to prefer), photos show us how we appear to others. Perhaps for this reason, the expressions we assumed for cameras have traditionally been closer to the affable, unselfconscious face we showed to the world. This has changed, owing to the invention of the smartphone and the new form it has spawned—the selfie—which allows us to watch ourselves as our image is captured. To scroll through the feeds of Instagram and Facebook is to see a gallery of Lacanian méconnaissance; the private longing once reserved for the bathroom mirror has become our most public face. And yet these photos are never as pleasing as we’d like them to be. The forward-facing camera mimics the reverse image we recognize from mirrors, but once the photo is taken, the technology flips the image as it would in a traditional photo. As a result, the still images always strike us as slightly askew: our eyes uneven, our parts reversed, our faces bulging on one side. 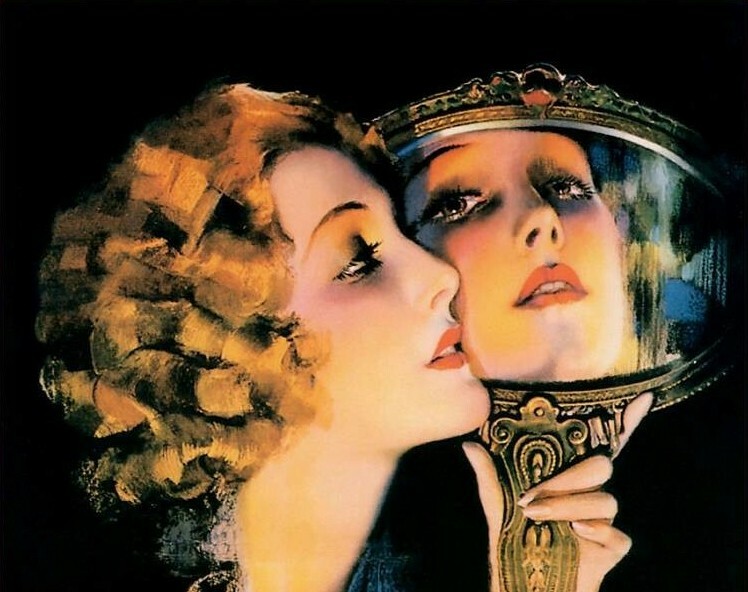 The popularity of the mirror selfie — the selfie taken in a mirror — speaks of our desperate need to preserve the delusional image, the ideal I that exists in our heads. Cultural critics of every generation have decried the narcissism of their age, but never before has a single object—the phone—been made to bear the entire weight of our descent into solipsism. Perhaps this stems from the irony that these devices were originally intended for connection and communication. The turn inward suggests the closing of some imaginative possibility: a window becoming a mirror. But these think pieces themselves exhibit a lack of imagination, reiterating the same points about skin-smoothing apps and body dysmorphia, rapturously quoting Chrissy Teigen, who once offhandedly called Snapchat “a narcissism dream machine.” Such commentary rarely breaches the true ontological disruption and psychic doubling that makes these devices so unsettling. One can only imagine the critical field day Freud or Jung would have with the face-swap filter, which allows you to, quite literally, project your ego onto another person. Few have pointed out that such apps depend upon “computer vision,” affirming the ancient fear that we are being seen by something sentient that lives on the other side of the screen, like the Slave of the Mirror who is trapped in the evil queen’s looking glass in Snow White. Can we ignore the fact that the screens of these devices, when idle, blink to the reflective obsidian of a black mirror? I once stumbled into an occultist subreddit where people were earnestly discussing whether iPhones and tablets could be used as scrying mirrors (the consensus: yes, but it’s easy to get distracted). One of the users then shared a stoner revelation that these technologies were already divination machines: they give us access to an esoteric font of knowledge and allow us to remotely view other people and places. The internet is one endless hall of mirrors where the line between our selves and our shadow souls is blurred. We guard against it with the flimsiest of talismans—Twitter’s blue checkmark, handles that insist upon “The_Real.” The most horrific moment in mirror fables comes when the hero realizes that his reflection is indestructible: to kill his double would amount to suicide. Now we have created a place where death is virtually impossible, where we are denied even the simple dignity of what the EU calls “the right to be forgotten.” (How many bloggers have deleted their archive only to find that it has been replicated in its entirety on a mirror site?) This is not to say that we are not complicit. All of us have entered willingly into this bargain with the devil, who knows better than anyone that our weak spot is vanity. Our online reflections—the idealized images that appear in Google image results—are largely the objects of our own creation, more real to us than our fragmented bodies. We have become the pale custodians of these digital eidolons, the marionettes of our shadows. Freud believed that doubles were a sign of psychic disintegration—a theory that has since been mythologized by midcentury auteurs, who dramatized a character’s free fall into madness through the appearance of a doppelgänger (Bergman’s Persona, Altman’s 3 Women, Hitchcock’s Vertigo). Unlike the primary narcissism that occurs in children, which is a source of power and delight, the adult narcissist finds her double uncanny and comes to believe she is being persecuted by it. This is the problem with megalomaniacs: they see themselves everywhere and believe all events are related to them. We have no shortage of scapegoats for our own paranoia: Twitter mobs, the NSA, malware. But the unease we experience in the digital maze recalls the deeper, more primal logic of horror stories and our most unsettling nightmares. There is a moment when you’re forced to acknowledge that the voice on the other end of the line is eerily familiar. You flee down a corridor, only to turn the corner and come face to face with yourself. What we are outrunning, of course, is our final end—our knowledge that Death owns a doll bearing each of our faces. That we now have a modern version of the Narcissus myth—“death by selfie,” people who have died in the midst of posing with sharks and on the edge of cliffs—speaks of some half-remembered truth that has already begun its descent into the collective unconscious. A more telling object is perhaps the funeral selfie. The collective outrage inspired by the news, several years ago, that many people take and post self-portraits during funerals is evidence itself that we’ve forgotten such myths. The phenomenon could not have surprised anyone fluent in psychoanalysis, which has long known that narcissism springs from that primal sublimation—our inability to countenance our own mortality. There are those who promise eternal life to those who post prolifically; our reflections, they say, are a form of digital DNA that will be used to resurrect us in some distant future. But I have never been able to buy into this vision. It’s more likely that these images are all that will be left of our souls. I sometimes imagine the Great Internet Archive as the afterlife painted by Solomon in the book of Ecclesiastes: a dusky underworld where our shades will persist in the preening poses we assumed during our waking lives, making duck face, among the echoes of our likes and shares, our witticisms and cheap jokes—all our wasted breath. Read earlier installments of Objects of Despair here. Meghan O’Gieblyn is the author of the essay collection Interior States. Her work has appeared most recently in Harper’s Magazine, n+1, Tin House, and The Best American Essays 2017.